Pertussis, commonly known as whooping cough, is an upper respiratory infection caused by Bordetella pertussis. Bordetella parapertussis causes a bacterial illness similar to whooping cough, although typically milder. Optimized detection of Bordetella infection is critical to ensure the best patient management. 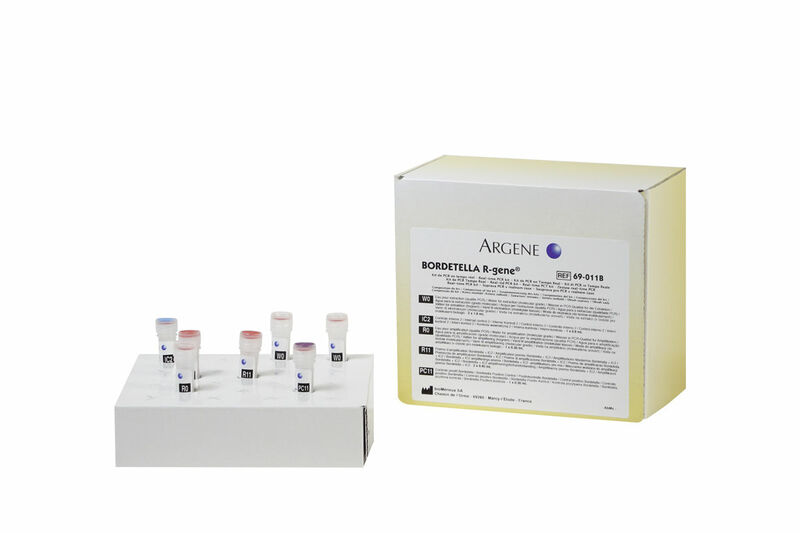 BORDETELLA R-GENE® offers rapid and specific detection of Bordetella bacteria containing the IS481 sequence, most commonly found in Bordetella pertussis. Similarly, Bordetella parapertussis R-GENE is designed for the detection of IS1001 region of Bordetella parapertussis. Both assays can be performed on respiratory samples (nasopharyngeal aspiration and expectoration). 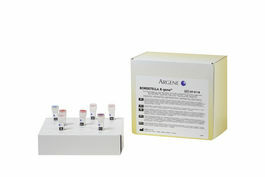 For even more optimized and comprehensive testing, you can use the ARGENE® Respiratory range to detect various respiratory viruses and bacteria from one sample or analyze various samples for one virus at the same time. BORDETELLA R-GENE® and Bordetella parapertussis R-GENE® are ready-to-use kits that detect the presence of Bordetella pertussis and Bordetella parapertussis using real-time PCR after DNA extraction. This 5’ nuclease-based Taqman technology amplifies and simultaneously detects a specific region of the bacterial genome. Using BORDETELLA R-GENE® and Bordetella parapertussis R-GENE® kits is simple. Just add the extracted DNA sample to the ready-to-use PCR master mix and start the reaction on the appropriate Real-Time PCR thermocycler, following optimized cycling program described in the “Instructions For Use”. BIOMERIEUX, the blue logo, ARGENE®,R-GENE®, EASYMAG® and NUCLISENS® are used, pending and/or registered trademarks belonging to bioMérieux, or one of its subsidiaries, or one of its companies. Any other name or trademark is the property of its respective owner. What are Bordetella pertussis and Bordetella parapertussis? Pertussis, known as whooping cough, is a highly contagious respiratory illness that mainly affects children under 5 years old. It is caused by the Gram-negative bacterial pathogen Bordetella pertussis, one of nine species of Bordetella identified today. This pathogen produces pertussis toxin, leading to inflammatory and necrotic impairment. Bordetella parapertussis has been identified as responsible for an attenuated form of whooping cough, called Parapertussis. These bacteria enter the body through the airways and attach to the mucosa of the upper respiratory tract (trachea and bronchi). Infection by Bordetella pertussis may be very serious – even fatal – in infants under 6 months, because they have no immunity against the illness (maternal antibodies against whooping cough do not cross the placenta). The disease can then lead to respiratory complications (apnea and bacterial surinfections). Whooping cough can, however, cause illness in people of any age. Approximately 40% of cases may be asymptomatic. In well-vaccinated countries, mortality and morbidity have been reduced by 95%. However, a change in the transmission mode of the disease has been observed for some years in the absence of natural or vaccination boosting. It is no longer transmitted only among children, but from adult or adolescent to non-vaccinated infants. What are the benefits of Bordetella pertussis and B. parapertussis testing? Real-time PCR is an effective alternative for diagnosing Bordetella as it offers sensitive, specific and faster results compared with culture, thereby contributing to better patient management.